2pm. Mia’s on watch in the rain. We’re only ten miles off the north side of Hornstrandir, but no land in sight yet. The fog has cleared, but the visibility is still too low to make out the mountains on the coast. Mia just re-led the genoa sheets to the outboard rail as the wind started backing into the east. We’ve got a bonus sail going now – no wind on the GRIBs to speak of, so we’ll take it. Linda & Jordan just woke up. I slept until noon. Taag and Dave are in their bunks. We’ve sailed almost 1,000 miles south from Svalbard and yet the temperature and the weather remains much the same. Grey, overcast skies, light drizzle, patchy fog and cold. Feels like we’ve gone sideways. I said to Mia earlier that when you leave the Chesapeake in November to sail south, you get a distinct change in climate along the way. By the end of it, you’re in shorts. Not so on this trip. We’re 14 degrees of latitude south from our northernmost point – but we’re still in the Arctic. It’s almost August, but still feels like winter here. As I type, I’m in my long underwear, jacket and hat. The hatch is open, so I guess the temperature has gone up a few degrees. But the climate feels the same. With luck, we’ll be in Isafjordur tonight. Just after dinner yesterday we spotted our second iceberg off to starboard. The first was too far to windward to chase it – we were sailing wing-on-wing in a pretty big sea, 6-8 feet, with 20 knots of wind behind us. Isbjorn was rocketing along. James & I flew the drone to get some of the coolest at-sea shots yet, and we successfully landed in in the roughest conditions we’d yet tried. But that first iceberg was out of reach. Our iceberg, seen from 15 miles away! By the time second one hove into view, the wind had lightened up, and we caught it in time to gybe over and beam-reach across to it. 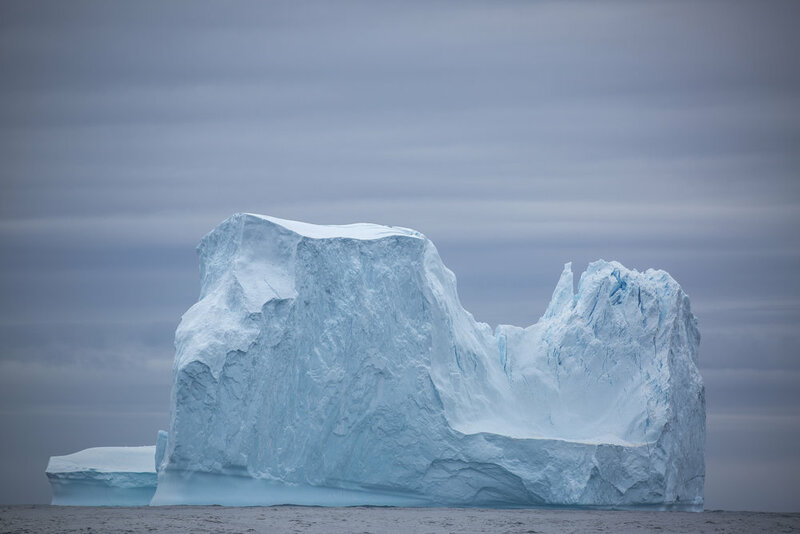 It looked big, like proper iceberg big, not just a chunk of old ice floating around in the water. We went chasing it. And chased it. And chased it. I was perplexed that it wasn’t showing up on the radar at 6 miles away – I thought for sure it was big enough to show on radar that close, and was a bit unnerved – what if we’d been in fog? Should I have lost faith in our radar? An unsettling thought. I zoomed out. And out again. Finally, at 12 miles, a target appeared where it should have, on the edge of the screen. By then we’d already sailed 5 miles towards it – Mia had marked the chart where we gybed – which means that when we first spotted it, it was a full 17 miles distant! Holy smokes. The megaberg on radar, at close range. Me and James took a nap while Taag and Dave piloted Isbjorn towards the berg. No need to get all excited just yet – it’d be 90 minutes until we got within reach to get the cameras out and fly the drone. We needed the excitement. The passage thus far has been almost too uneventful. Calm spells interspersed with really fine light-air sailing, but overall gloomy weather and low-energy from the crew. Most of the time it was either too cold or too wet to sit outside unless you were on watch, so the 7 of us were seldom together, even at mealtimes. The one afternoon where the sun did make a brief appearance we took full advantage of – stopping to swim and enjoying a celestial practice in the cockpit. That last all of an hour, and we haven’t seen the sun, or even blue sky, since. I feel asleep on the high side settee and was jolted awake when my leg fell off the cushion in a small roll and flopped on to the floor. 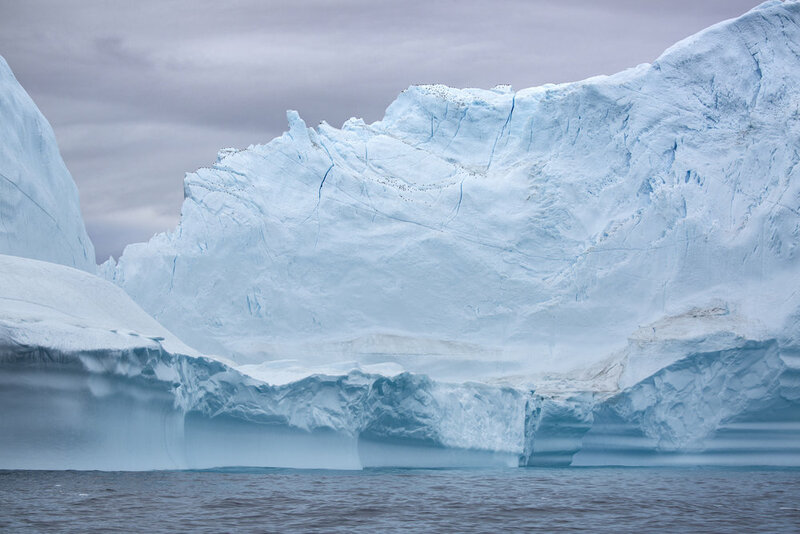 As we neared the berg, it’s scale became more apparent. Still 2 miles off, according to the radar, it felt like we were right on top of it. You could hear the waves crashing against it’s shores. 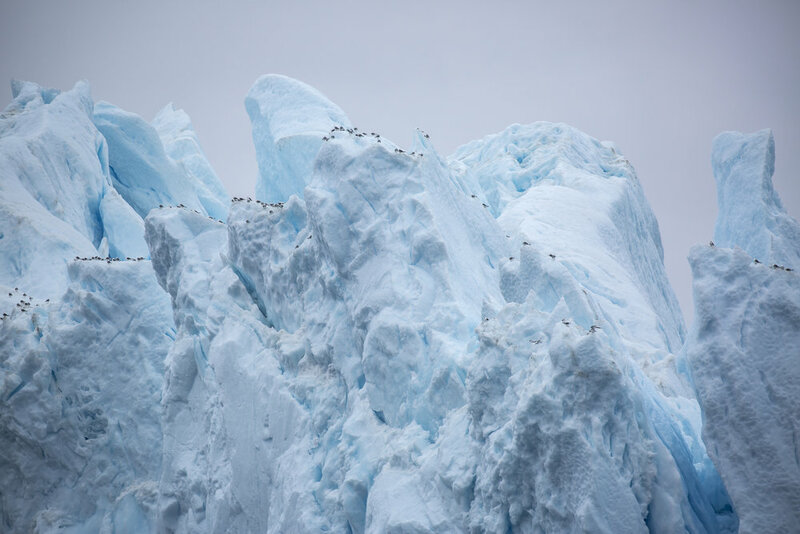 Towering cliffs of white & blue ice shot vertically out of the sea. The waterline had been smoothed to a fine polish as the sea eroded it over time. It must have been sitting in the water like this for some time without rolling. Approaching the iceberg, 100 miles north of Iceland. At a mile and a half out, James flew the Phantom for a closer look. High above the iceberg, it’s underwater foot was visible in the clear, deep ocean water. Isbjorn was 100 miles from the nearest land, about equidistant between Iceland and Greenland in the Denmark Strait, and the water was pure. From above, the white ice disappeared into the sea and turned an electric teal blue. The underwater shelf of the berg extended outward beyond it’s high cliffs for several hundred meters on one side of it. Find ISBJORN…gives you a sense of scale! That thing is downright alien! From above the berg was horse-shoe shaped. 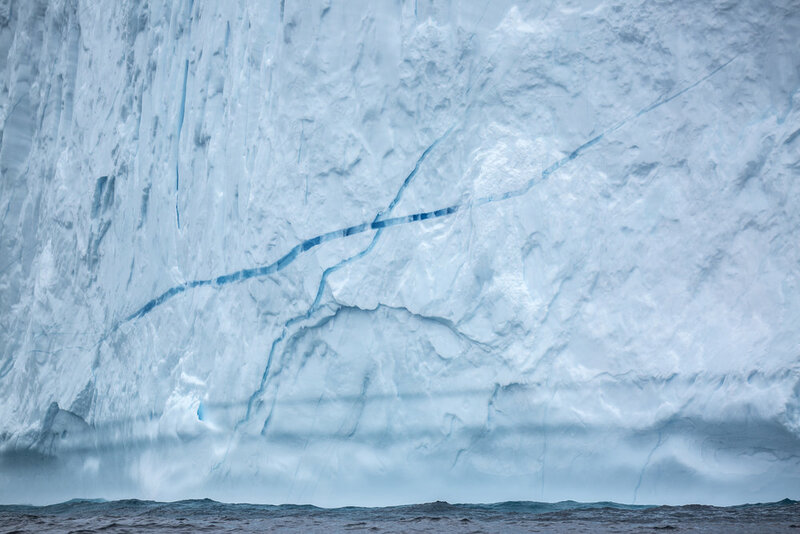 What appeared as a tall, solid block from onboard the boat resolved into a tall, steep, u-shaped line of ice cliffs that opened up on the side opposite to us into a beautiful turquoise cove. The underwater shelf extended out into this cove giving it the ethereal look of a tropical hurricane hole but high in the Arctic. I was temped to take the boat into the cove and anchor on the shelf, but the danger of this unstable chunk of ice was obvious, so we’d keep our distance. By then the wind had died but the swell remained, so Isbjorn’s mainsail slatted incessantly to my chagrin. We dropped it, but then the boat rolled on her beam ends as we all gathered around to try to take photos of our iceberg. We motored Isbjorn to within a half mile of the berg, it’s cliffs towering high above the mast. 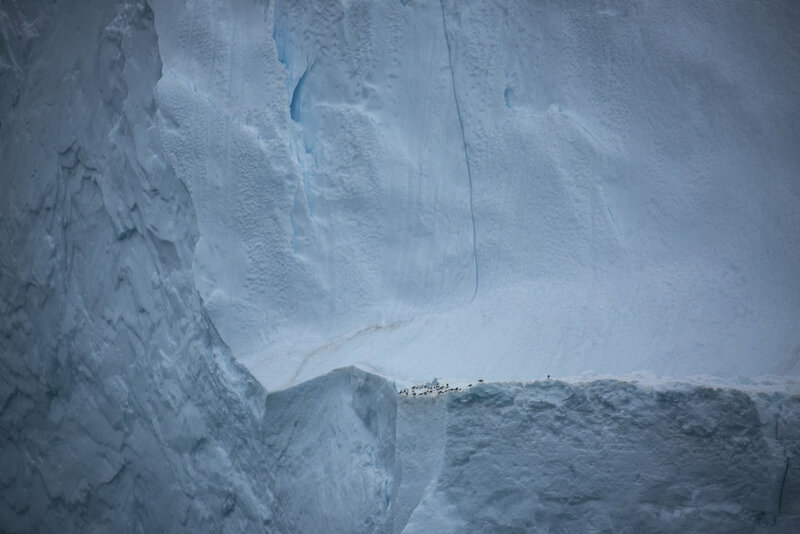 We felt much closer, but then seeing the boat and berg from the drone showed just how far away we were. 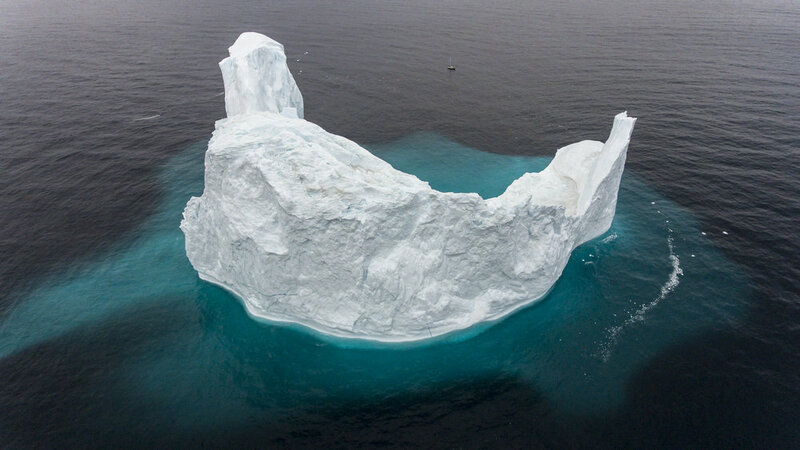 This thing was a floating glacier as much an an iceberg. James measured it’s highest peak at 120 meters from the drone – that’s nearly 400 feet! We maneuvered around the backside of the berg to get a sea-level view of the cove created by the horseshoe cliffs. The only way to properly describe the sight was that it felt alien, not of this world. The ice cliffs had a strangely geometric shape to them you just don’t get in rock or dirt cliffs, square angles from pieces broken off and plummeting into the sea. Like the surface of a stealth fighter plane, all straight lines and sharp angles. It could easily have been a tropical island in how it was shaped, or like something you’d see on moon. The berg elicited a very calming yet strange emotion from me, like I was seeing something human eyes are supposed to see. Seeing the underwater shelf from the drone reminded me of the alien things from the movie The Abyss. 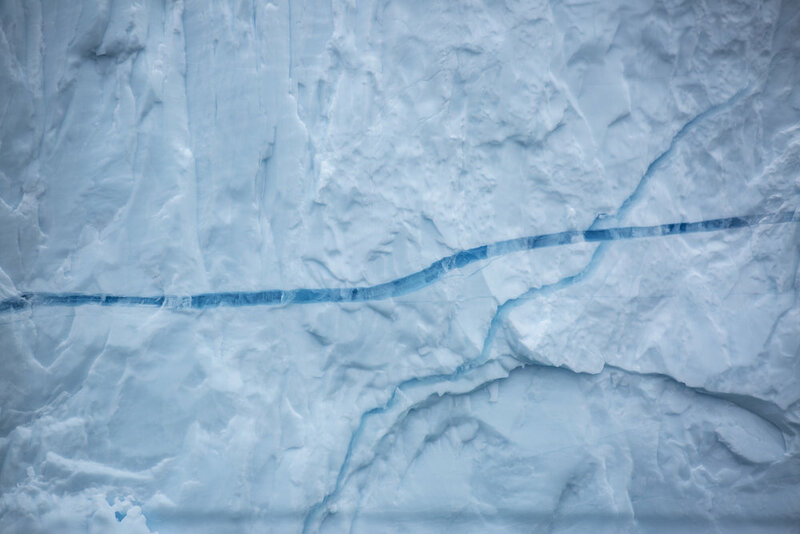 We hovered around the berg for 90 minutes or so filming, droning and just observing this massive piece of glacier that must have broken off in far northern Greenland and ridden the current south. We got underway again around 10pm, a full 4 hours after Linda First spotted the berg and we diverted. In the end it was a 32-mile diversion from our rhumb-line course to Iceland, but was so worth it. We’d be in Isafjordur by now had we kept on going, but then this blog entry would have been far less exciting. We’re starting to hear Icelandic now on the VHF as we near the coast, and after not visually seeing a single ship on the route south (and only 1 sailboat on AIS), suddenly the chart is covered in AIS targets from fishing boats surrounding the Westfjords and radar targets all over the place. It always feels weird re-entering civilization after a long ocean passage, but considering where we’ve come from, this my be the most dramatic re-entry yet. Oddly, we’re still on the edge of the world. I mean, Iceland isn’t like your most popular cruising destination. But we feel so much closer to home, and I feel very relaxed now that we’re on the cusp of leaving the Arctic for the summer. In another 5 miles we’ll be south of the polar circle for the first time since May 26. I have a feeling we’ll be back.